Home / Budget 2019: What’s in it for Tradies? 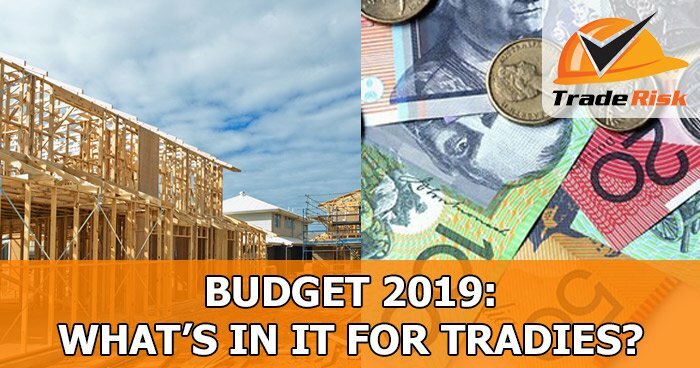 Another year, another budget… But what does it actually mean for you as a tradie or trade business owner? Every year since 2015 we’ve been putting together a summary of the changes that we believe are most relevant. Kicking off with some good news, the Government is increasing the amount a business can instantly write-off from $25,000 to $30,000 for a single asset. This scheme was originally introduced in 2016 and has proven to be very popular with tradies and small business owners in general. This scheme doesn’t actually mean you get any more money back in your pocket, but it does mean you get it years earlier as the asset can be depreciated to zero immediately rather than over a number of years. Being an election year, it’s no surprise the Government is throwing around a bunch of tax cuts to keep voters happy. Last year the Government introduced a tax offset which meant taxpayers earning up to $90,000 could receive up to $530 extra back at tax time. This year it has been more than doubled to $1,080 and will apply to the 2018/19 financial year. Our ‘How much do tradies earn’ report last year revealed that the average taxable income for a self-employed tradie was $81,636. With that being the case, most tradies can expect to get some level of tax offset when they lodge their next tax returns. Looking further ahead, tax brackets up to $200,000 a year may eventually be reduced from 32.5% to 30%. Whilst a $200k+ taxable income isn’t the norm for tradies, it’s not completely unheard of. More money in your own pocket rather than the Government coffers is always a good thing. The Government has announced a $525 million skills package to help create 80,000 apprenticeships. Each apprentice will receive a payment of $2,000 when they hit key milestones, whilst employers can receive an incentive payment of $8,000. It’s unclear exactly which apprenticeships will benefit, however the ABC reports that trades include (but are not limited to) bricklayers, carpenters and plumbers. Better funding for apprenticeships can only be a good thing in this industry. A $100 billion infrastructure spend has been announced nationally, which mainly benefits Victoria and Queensland. Being infrastructure means there will be plenty of labour required to keep things moving. With residential construction coming off the boil, this extra work will come at a great time. Many young tradies have children in child care, and if you have them in care every day of the week you know you’ll probably hit the number of hours threshold. The Government is helping by allowing an extra 15 hours per week of subsidised care. The catch is that the increase only applies to three year old children. There aren’t too many losers in this year’s budget, which is really not surprising given how close we are to a federal election. At Trade Risk we specialise in business insurance, not accounting. We might have a good handle on the accounting side, but it’s definitely not our thing! We strongly recommend you speak with your own accountant about your personal circumstances. If you don’t have one, then you should follow the link to check out our tradie accountant guide. Author: Shane Moore. Last updated: 02/04/2019.